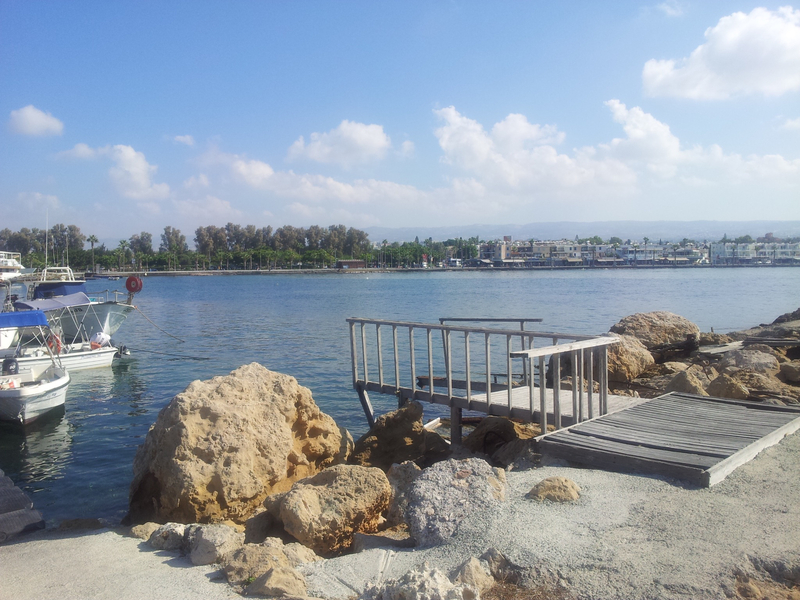 Cyprus is a huge surprise in many ways in a small parcel …. urban developed areas close to , diverse rural areas and various mineral resources ( copper, iron ore, huge deposits of sandstone and limestone …. you can see the layers of earth … tossed up and tortured.. warped by the movement of the planetary plates millennials before … so diverse in the sea, the land … farming … surprisingly close to developed areas are the original small villages.. as with all humanity the surface of Cyprus covers human souls in transition … . Cyprus is in Eurozone and hence the currency is the Euro …. food quality is good, and not unreasonable (when you buy the wide diversity of local produce) – large supermarkets – well stocked … I am living in the town of Paphos, of about 30,000 people normally, population nearly doubles in the summer with European, UK and Russian visitors. Small villages surround it, some are tiny …. roads in these villages are single lane, the width of these village roads aren’t much wider than the width of your car, they were designed for donkey carts. 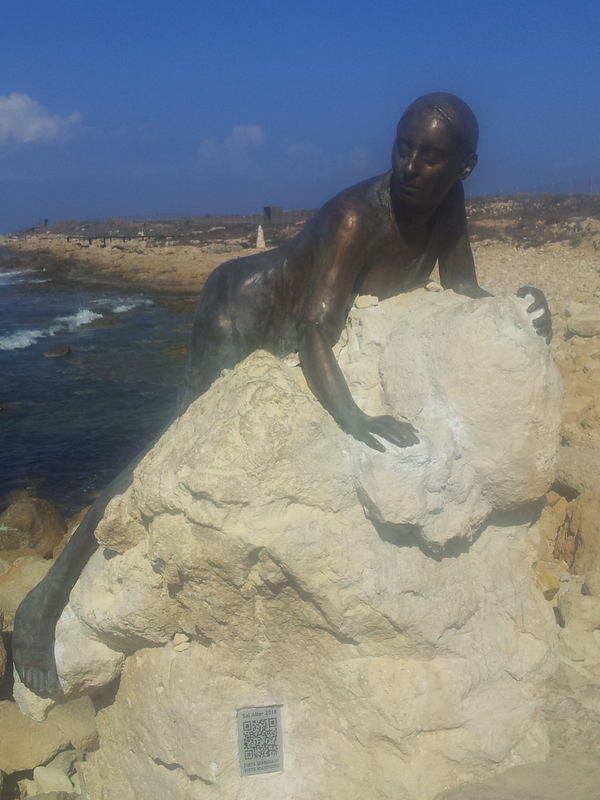 Paphos has its own Bronze statue, not quite the “Little Mermaid” as in Copenhagen .. judge for yourself from the photo. Cyprus has been inhabited for thousands of years and there is a responsible an refreshing attitude to history and in particular to archaeology … to the past .. where so may of the lessons of humanity reside. 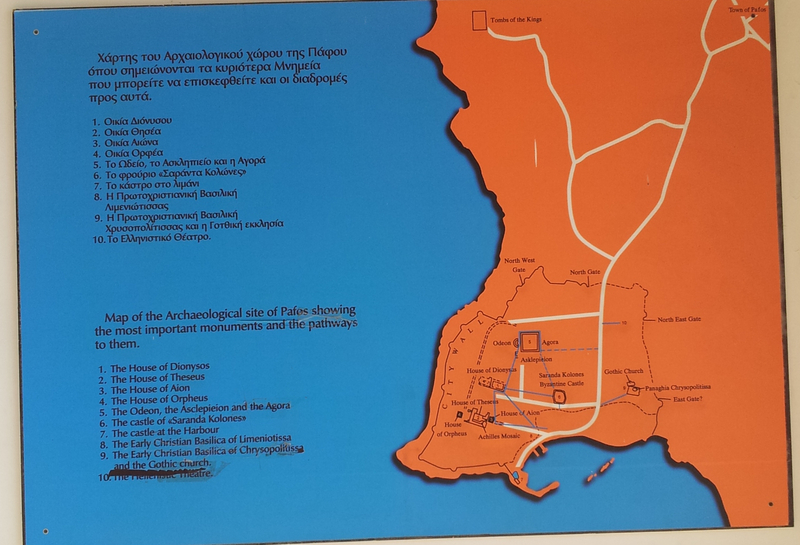 There is a World Heritage Site in Paphos, the map is shown here. I have with the generosity of my friend Mark, been to many places, recently going to Latchi and Polis situated in the western, north facing area of the island …. it is quite wonderful to see the diversity of the island and by and large the friendliness of its people. I have had many challenges in my time in India, culturally, emotionally, physically and health wise, they have dramatically changed me, to in my view, prepare me for what is to come. More than anything they have changed how I look at large groups of people, the herd of humanity so to speak, it enabled me to change, to assume nothing, to project nothing, when we can do this we can push through the surface and to see them for who they are as individuals. People in India are little different to us, except in that they are a product of their culture, their community, their environment and beliefs, and this can manifest in many ways, one maybe an emotional repression, but remember they all want what we want at the end of the day … their life like ours is a reflection of the personality, for most of humanity this is the ego mind which creates our life individually and on a wider view, collectively for all of us. This experience came as I hobbled across the road yesterday in Dehradun. A young man, without legs … sitting on a kind of board with wheels came up to me … it truly breaks your heart, but a big smile on his face changes the impact, changes everything – it hit me as it always does, that it is truly in our attitudes where we create our lives. In the West we may have some expectations of life, he had none, there is no safety net for him here, no social programs … but he was smiling .. a lesson and inspiration for all of us. It reinforced in me a way to live .. from humble gratitude, staying present, accept, flow and help who you can, how you can, when you can. There appears to be a defining difference between the older and the younger generations … when it comes to love and relationships, many of the younger generation here seem to have a more open different view on life, happiness and love ….